Armed Gardaí to be deployed to Rathkeale. In the news of late is Rathkeale, not for good news apparently. Armed police are to be deployed to this small town in the run up/during and after Christmas period. Large numbers of “travellers” come to the town each Christmas and its become quite rowdy time for Rathkeale. Haven’t heard of a lot of trouble happening but the deployment of armed police at Christmas time is becoming a regular event. These visitors constantly drive up and down the town in swoosh cars which are actually rented for the Christmas period. They are annoying and cause traffic jams, feral children are also a problem. Don’t see why they all come to Rathkeale as they are living their lives elsewhere. Some business in town do well from the influx of “Visitors” but they give a bad image of Rathkeale and many houses are boarded up for the rest of the year. Rathkeale becomes half a Ghost town. The “Traveller” community is over represented in Rathkeale and more should be done to encourage people to live there and more business/employment attracted to the town. 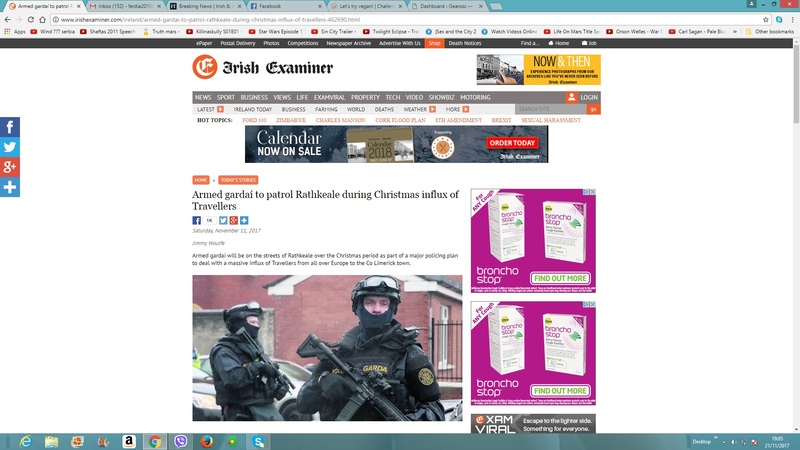 Author adminPosted on November 21, 2017 December 11, 2017 Categories Ireland PoliticalTags Armed Gardai, Rathkeale, Tinker town, TravellersLeave a comment on Armed Gardaí to be deployed to Rathkeale.